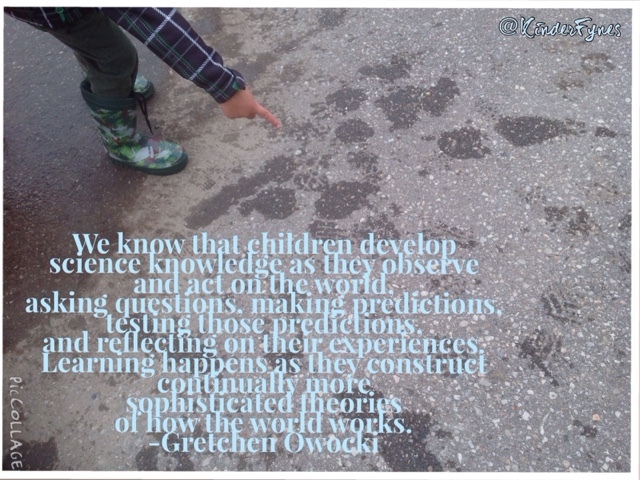 Water leads to wondering... wondering leads to engagement... engagement leads to learning. I love SS's story. 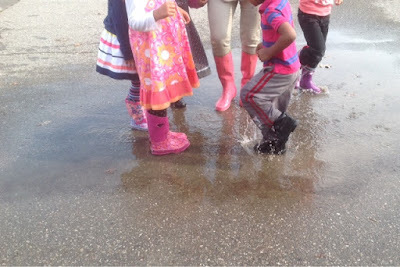 It highlights her determination and growing self-regulation skills, the learning that happens when you look closely and observe changes in the local natural world, and most of all, the joy of playing in a puddle. A photo I've shared in the past, when describing the "decisive moment" in capturing a mood in a photo. I couldn't help but notice how many of the photos I chose to illustrate moments of learning involved water. I have long used the term "puddle jumper" to describe a certain type of person, a kindred spirit... someone who embodies playfulness and joy well into adulthood. Friends know I'm likely to go out when it rains, looking for snails or following rivulets that run down the street over leaves and stones. My penultimate post was an extended metaphor for documentation, seen through the lens of reflection on water. It was inspired by the idea that reflection is always changing, based on one's point of view. 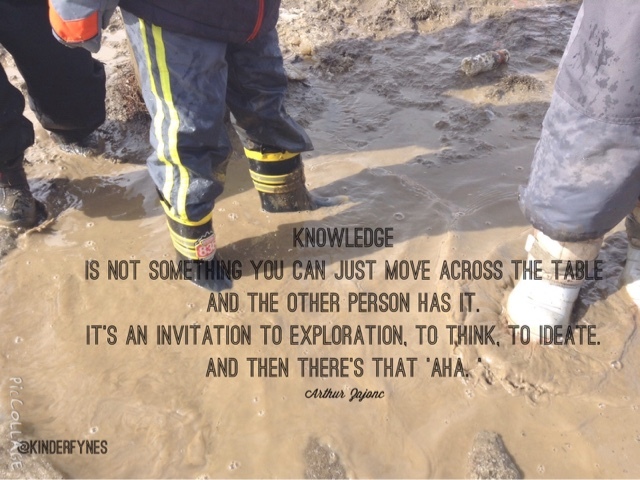 A few days later, I shared the incredible learning journey of a friend and colleague who embraced full-bodied exploration of a puddle with her students, and was changed by the experience. 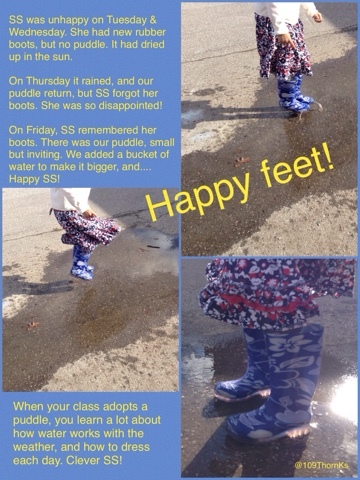 Our class adopted a puddle last year - two, in fact. The year before, my AM and PM classes had each adopted a tree to visit weekly, but the idea just didn't catch on in our new FDK class. The water that gathered near the walkway to the buses, on the other hand, fascinated all. One puddle, near our neighbour's classroom gate, appears and disappears at the whim of the weather. It grows to a small pond after a hard rain, and dries up with nearly a trace after a day or so of sun. It is a wonderful thing - reflecting the school or the sky, depending on where you look. It grows large and deep at times, and later leaves only a darkened shadow of itself, a mere grey trace. In September our returning SK students quickly taught the new JK friends what our class does after a good rain - here's a group of kids well dressed to enjoy the sometimes puddle with my teaching partner, Pooneh in the back (pink boots). One day this fall several students were excited to discover how chalk reacts to getting wet, and conversely, how our puddle reacts to getting coloured on. The traces of this joyous play were beautiful for days afterward. When I find a quote meaningful and wish to share it, I look for a photo from my own experience that illustrates the idea for me. It struck me this year that nearly half of the pictures I've used in the manner have involved discoveries or exploration of water. Noticing our environment means finding patterns, traces, and surprises in nature. The other puddle, a little strip of water that forms beside the concrete bunker just outside our gate, is affectionately known by all in our class as the "muddy puddy". My teaching partner and I have joked that this puddle is the reason many students beg their parents to buy them rubber boots. Mud is magnificent stuff. 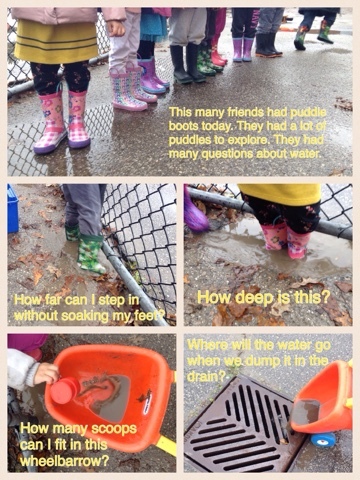 We explore it near and far around the schoolyard. 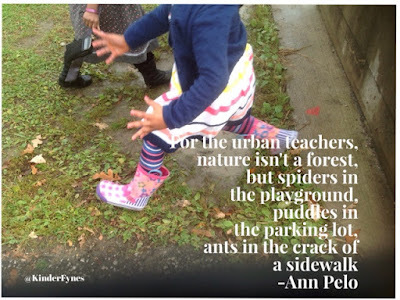 The beloved "muddy puddy" is a perfect illustration of one of many quotes from Ann Pelo that speak to me of eolithism - learning in and from the immediate environment. 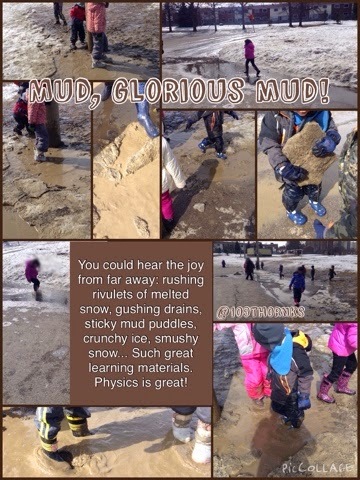 The picture above rather beautifully captures our learning one day - a cold, muddy puddle can be utterly delightful, or utterly misery, depending on how well dressed you are, and how well you pay attention to the details: how deep the puddle, how high your boots, how thin the ice, how sloshy the mud, how splashy the other kids in the puddle with you. 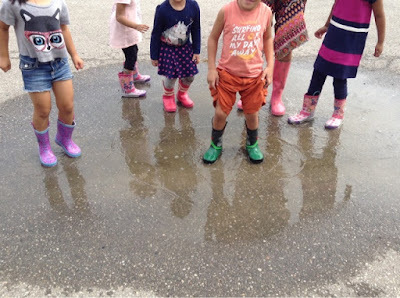 By encouraging self-regulation, we allow students to figure out for themselves whether or not the mud puddle is an appropriate place for them to play. These students on this day listened to their bodies and to the situation, and had a marvelous time. Many other students watched from a safe distance on the hard ground. We applauded both choices. The muddy puddle exploration on this day left an indelible mark on my mind - and I believe it will be remembered by those students for a long time, too. We learned about bravery, made mistakes, and played on. It was a grand outing, even though we were only out on the yard. 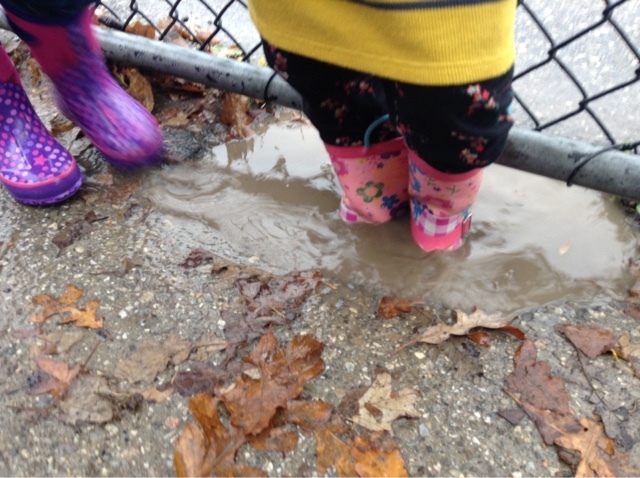 Sometimes the rain winds up creating new puddles, like these deep craters in the post holes around our kindergarten playground. This girl tested the height of the water against the height of her boots, and was happy to find that her feet stayed dry. 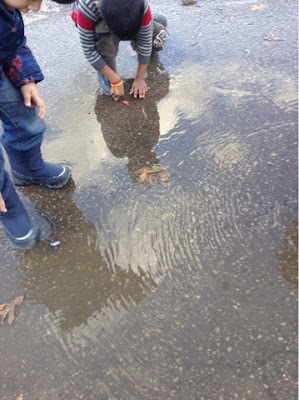 Math and science was all the talk around the puddle this day. 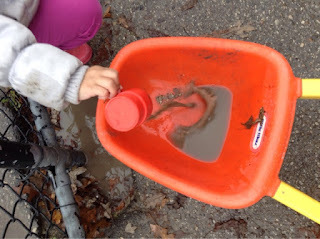 More math play happened when this student found a cup for scooping and tried to empty the deep crater that her friend had been standing in (see above). I didn't stay long enough to capture how many scoops she had to do to fill the wheelbarrow, but it was already 15 when I left to explore elsewhere. It was the collage below that lead me to believe it was time to look back over our learning thus far this year, and try to get at the big ideas students were exploring in their fascination (and mine) with water. Several projects and inquiries are ongoing in our class at the moment, and the year is winding down towards the winter vacation, thus making new conversations harder to facilitate during our short knowledge-building-circle time. I knew there was a theme emerging, one I'd want to remember and be able to share with the children later in the year when it came up again (as naturally it does when snow melts and freezes anew). 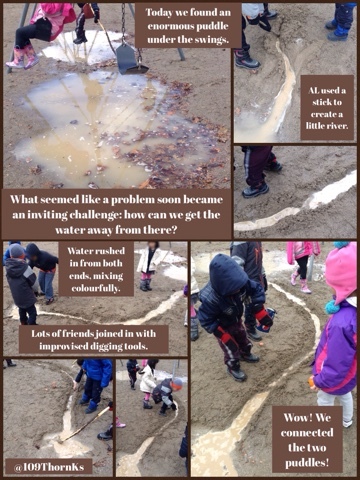 A recent water wonder from our class. I can't help but wonder where the arrival of snow will lead us in our questioning. This wonderful day at the park last year remains another favourite memory for several students, now SKs. Puddles seem a perfect metaphor for emergent curriculum. Even more so in a difficult year, when the social curriculum seems the most important lessons being highlighted each day, the need to "get one's feet wet" remains. Through relationships forged over messy play outdoors, friendships and trust are born. If you see a problem to solve, learning is inevitable. 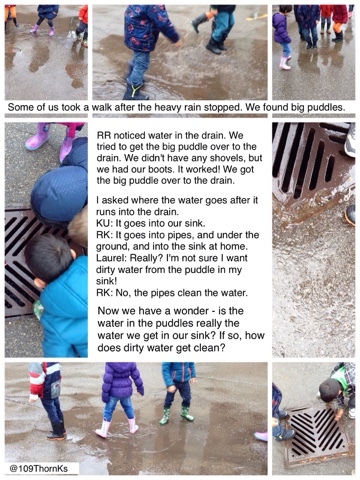 I thank my friend Nadine for sharing her puddle story, and inspiring me to look back over my own. I will consider it a success if this inspires even one reader to invest in a good pair of winter rubber boots. If you've learned something from a puddle, please consider leaving a comment here.